Most of Africa, Europe, the Middle East and eastern Asia will see this eclipse. For far western Africa and Europe, the eclipse will have started by the time the Moon rises. The full Moon will rise just after sunset on Friday 27 July. At 7:13pm SA Time (17:13 UT), the Moon will start moving into the penumbral (partial) shadow of the Earth. Less direct sunlight will reach the eastern (lower) side of Moon, and you may notice the Moon dimming slightly from that side. At 8:24pm (18:24 UT), the Moon will start moving into the umbral shadow of the Earth. From this time, the Moon will appear to change shape. From 9:30pm (19:30 UT) to 11:13pm (21:13 UT), the Moon will be totally eclipsed. At 00:19am (22:19 UT), the Moon will be out of the Earth’s umbral shadow and the observable eclipse will be over. 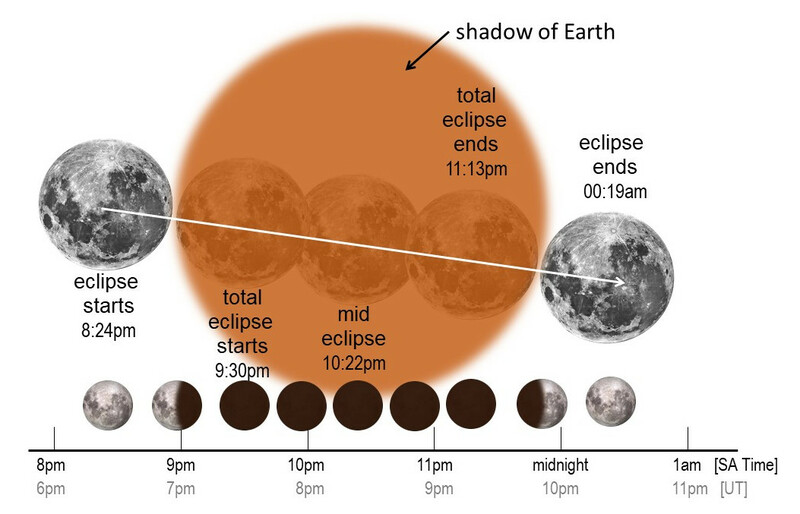 By 1:30am, the Moon will have left the penumbral shadow of the Earth, and will have recovered to a fully-lit full Moon. You don’t need any special equipment – Just go out and look. Don’t miss Mars – the bright orange “star” near the Moon on Eclipse Night. 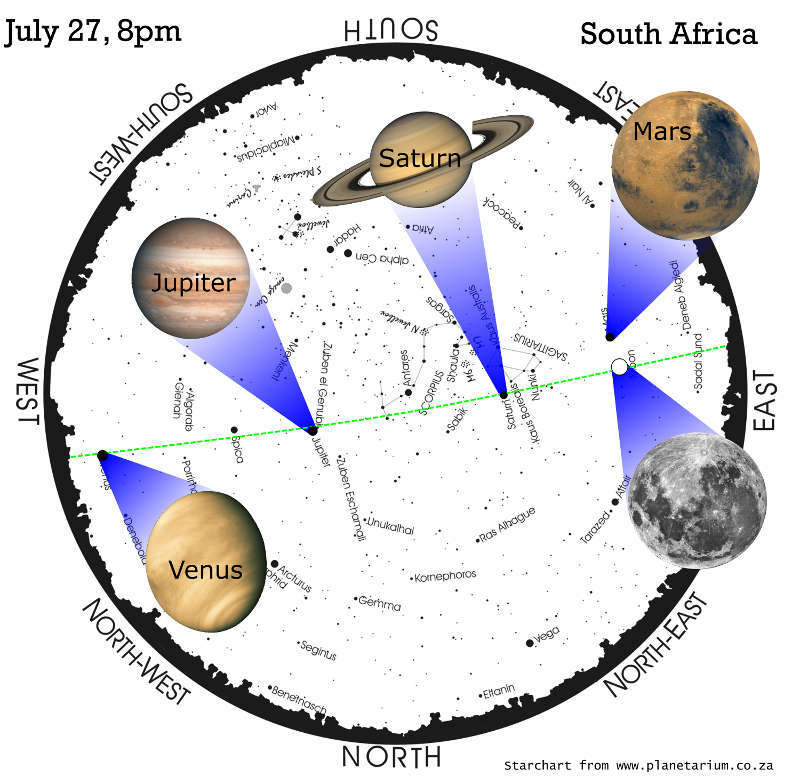 Don’t miss the Planets tonight! On eclipse night, four planets will be easily visible to the naked eye. I f you look for them, you’ll see that they stretch in a line across the sky, from Venus in the west to Mars and the Moon in the east – you’re looking at our flat solar system from the inside. Venus is the very bright “evening star”, high in the west as the Sun sets; a small telescope with good optics and enough magnification will show a “half-Venus” – Venus has phases, like the Moon. Venus will set as the eclipse starts. Jupiter is also worth looking at with a small telescope – look for its four largest moons. Saturn is another good telescope target – look for the rings. Mars is at its brightest this week and noticeably orange – completely coincidentally, our planet is passing Mars, and we’re closer this time than we have been since 2003. It will be near the eclipsed Moon – very cool sight! If you’re in a dark place, you should see the faint stars of Capricorn around the Moon once the Moon is totally eclipsed. The Southern Cross, the Scorpion and Sagittarius are the easiest constellations to see this evening. or get yourself a planisphere with most of the constellations. At the old Observatory, in Observatory, Jhb, hosted by Astronomical Society of SA (Jhb). At Pearly Beach, near Gansbaai, hosted by the Southern Cape Astronomical Society. For more event locations, or to add your own event, visit our Lunar Eclipse 2018 event-map. Tell people about the eclipse – at work and school – download a poster here. From the eclipsed Moon, the Earth’s atmosphere looks red – a ring of sunsets and sunrises. This light gives the eclipsed Moon its colour. Even at mid-eclipse (10:22pm) the Moon won’t be completely dark – sunlight shining through the Earth’s atmosphere is refracted (bent) towards the Moon. The colour is affected by particles in the atmosphere – especially dust and ash from volcanoes – which scatter blue light out of a sunbeam, and leaving the red to pass through. So, the colour of the Moon at mid-eclipse tells us about dust and ash in the atmosphere. 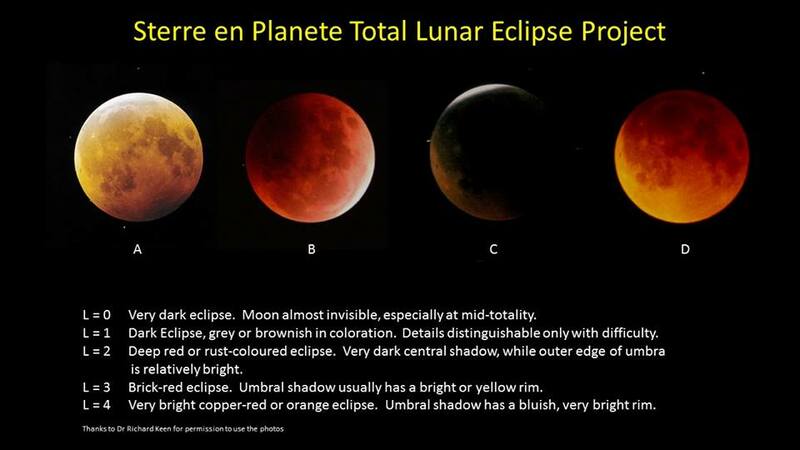 Sterre & Planete are inviting people to estimate the brightness of the Moon at mid-eclipse. You can join the S&P Facebook group, or take part via the Pretoria ASSA Facebook group. Which brightness would you assign to A, B, C and D? The next total lunar eclipse visible from start to finish from anywhere in Africa is in 2025. 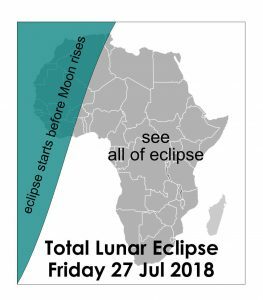 Mon 21 Jan 2019 Most of Africa will see the start of this eclipse, in the early morning. Totality will only be visible from north-west Africa. Fri 14 Mar 2025 Only north-western Africa will see the start of this eclipse. 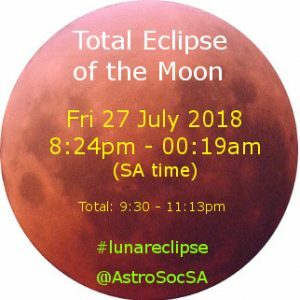 the July 2018 lunar eclipse for the southern hemisphere, here. A poster for raising awareness of the eclipse. 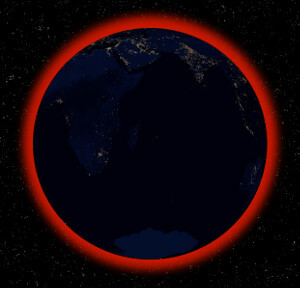 A scale-model lesson to explain why we don’t have eclipses every month, for grade 8 and up.